I have it in black and I LOVE IT! It's so light and small, easy to pull out and return to the cupboard, it doesn't take up much space and it's very easy to clean. It's got a 3 cup bowl and a super sharp blade. I don't use it to chop veggies but it makes the best pesto, perfect bread crumbs, grinds hard cheese in an instant. It's fast, powerful and does not leak! 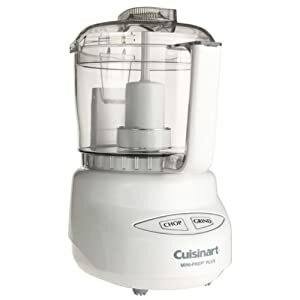 If you need a food processor but think a big one will be too much machine or too pricey, try this little gem out. It's on the list of my favorite kitchen essentials. Which I'll post if anyone is interested, let me know. *NOTE* The integrity of my blog is of the utmost importance to me. This post is not a paid advertisement. But I am part of the Amazon associates program so if you click through to Amazon from my blog and purchase anything, I do get a tiny percentage. Though I haven't even made enough to get my first $10 check yet.